Profilium has extensive experience in designing and fabricating belt conveyors using aluminium profile. 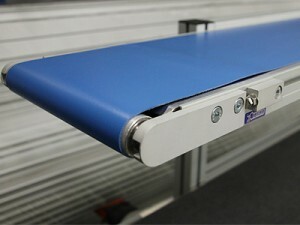 Our belt conveyors can be customised to virtually any size. Pending the type of belt required, our conveyors can also be built quickly and offer a cost-effective, high quality option for most conveying requirements. Ideal for cartons, bags, sachets, warehouses, mail rooms and more. Available in 3 load ratings. Click on the Tab below to read more about Belt Conveyors. Slat conveyors are perfect for conveying bottles, cans, jars, tetra-packs and similar. Aluminium slat conveyors are a cost effective alternative to stainless steel and can be easily customised to suit your application. Click on the second Tab to read more about Slat Conveyors. Perfect for Light weight to Medium weight applications. Heavier applications possible, subject to scope. We offer a variety of fabric belt or rubber belt types to suit your product mix. Our Belt Conveyors can be supplied with food grade (anti-microbial), rough top, heavy duty, multi-ply or cleated belts and everything in between. Profilium has a range of standard belt conveyor designs that can be manufactured quickly and adapted to suit your requirements. We offer options for Mini Belt Conveyors, Ultra-Light, Light-Duty, Medium and Heavy Duty Belt Conveyors. Series 30 Conveyors are best suited for ultra light and lightweight products (up to 15kg/m) or where there is restricted height for installation. The Series 30 belt conveyor offers a slimline body height of only 40mm with head and idler rollers only 30mm. This allows the Series 30 Belt Conveyor to fit into tight spaces, which makes an ideal solution for installing inside existing machines or anywhere space is at a premium. If you are looking for a mini belt conveyor, this is the best option. Standard Components mean the Series 30 Belt Conveyors are Easily and Quickly Customised to suit your products or available floor space. 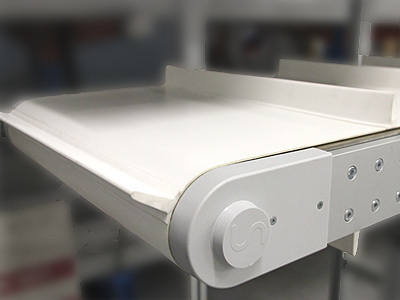 The Series 50 Conveyors are best suited for light to medium weight products up to 30kg/m. The Series 50 Belt Conveyor offers a slimline body height of only 45mm with head and idler rollers of 50mm. The Series 50 is a flexible conveyor system which can be used for horizontal conveying and elevating products. A robust yet economical elevator conveyor or incline conveyor can be achieved by adding cleats to a standard belt. This style of conveyor are virtually modular and so can be easily and quickly customised to suit a specific application or product. As an option it is also available as an incline or decline conveyor. The Series 90 Conveyors are best suited for medium-heavy weight products with a maximum belt loading of 70kg/m. 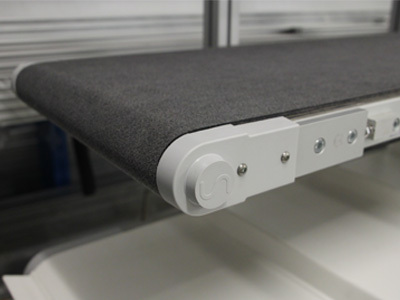 Aluminium profile Series 90 Belt Conveyors are highly modular and can be customised to fit into your available floor space or to suit a specific product. The Series 90 offers a robust 90mm high side frame with head and idler rollers of 95mm. The series 90 can be used for horizontal conveying and elevating products. A robust yet economical elevator can be achieved by adding cleats to a standard belt. As an option Series 90 conveyors are also available as an incline or decline conveyor. Slat Chain Conveyors (also called Slat Conveyors or Tab Chain Conveyors) are suitable for a wide range of industries and products. We have manufactured slat conveyors for foods, beverages, chemicals, medical samples, pharmaceutical products and many, many other applications. Slat Chain Conveyors are amongst the most versatile conveyor systems available. Slat conveyors suit a wide variety of applications and the aluminium style are generally suited best for lighter applications up to approx. 3kg and a width of up to 200mm. Aluminium slat chain conveyors are designed and manufactured by Profilium in Australia! Our slat conveyors can use generic slat chain, meaning you are not locked in to expensive proprietary brands. An aluminium slat conveyor system is suitable for conveying a wide range of products. It can be implemented anywhere — from standard product transfer applications, through to full turnkey solutions. Our standard conveyor modules are compact, simple and easily configurable to suit any light-duty system or application. They are manufactured using aluminium profile side plates, making them modular and easy to configure for a customised layout. All modules are 'plug-and-play': simply bolt them together, add a head and tail and your conveyor is ready to go — further reducing costs. Profilium offer a wide range of slat conveyor modules that can be added together to design a complete system. We also offer an extensive range of chain types and accessories. Contact us for further information.